Back for their second year next to a pumpkin patch near Eastridge Mall. This time they have 3 full-blown haunts, up from 2 last year. These were very well done despite having fewer actors than some of the other places below. There is also a neat midway that connects all of the attractions and features a Halloween store. They are known for a very long maze with seemingly never-ending black corridors that break up the scares. Admission is $20. Still the largest Halloween event in Northern California. 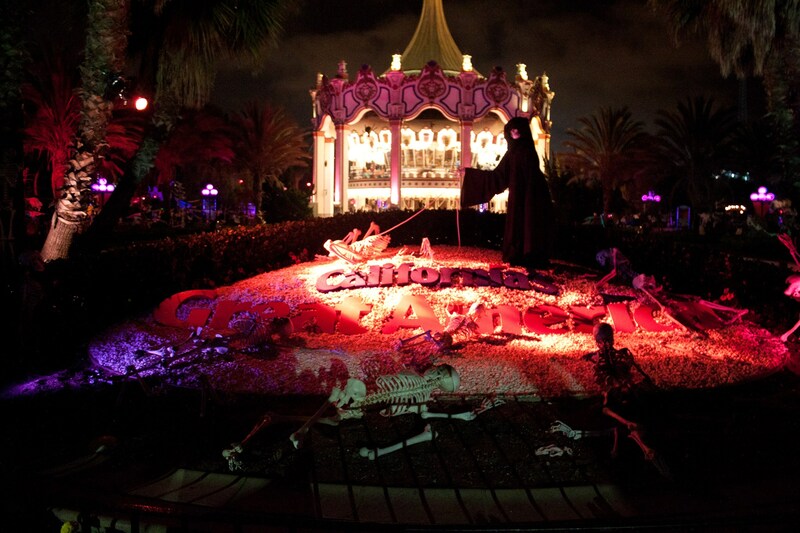 Now in its sixth year, the word has gotten out on Halloween Haunt and the park is packed even on day 1. Sundays are probably your best bet if you want to hit all of the haunts. There are now 8 haunted mazes, a single haunted ride, 3 scare zones, and various shows (2 of the mazes are new this year, as well as the ride). Most rides worth going on are still open--including the new Goldrush--and the roller coasters are being run with all the lights turned off. The preeminent Bay Area Halloween event for almost 2 decades is returning this year with an another great event. There are 5 haunted mazes this year, a Halloween Carnival, and several micro-attractions. This is MUCH MORE intense than Great America, so don't bring your young children. You'll get scares from every angle, including above and below you. The haunts are extraordinarily well done, and they only let in small groups. This was the biggest surprise of last year and one of the best haunts I have ever done. The groups are limited to only 2 people, there is quite a bit of acting and storytelling, you have interactive elements like hidden doors, and finally there is one scare prop (think chain saws and air guns) that will blow you away. I didn't do this one this year, but I heard it was great. Instead of doing 2 haunts they have one very large maze. The haunt should take 15+ min and incorporates part of their cornfield maze. A high school production may seem out of place on this list, but I assure you that this one is 100% worthwhile. As opposed to your typical maze where you have people randomly popping out at you, each year there is a unique story with hundreds of actors, making you truly feel like you're immersed in the script. You can also forget the saying "don't touch the actors and they won't touch you." Past events have included surprises like receiving fake shots, being completely separated from your party, and even wet hands touching the back of your neck while you are in pitch darkness. Insanely scary and much more interactive than any of the other events. Plus the money connected is donated to charity. One caveat, due to how awesome this haunt is there may be a 2-3 hour wait. At least you'll have the high school dance team dressed up as zombies entertaining you (and performing Thriller in its entirety every 15min). The cost is $8 per person. Oct 24-26 only, starting at 7pm. 555 Glenwood Dr., Scotts Valley. This was the single most impressive haunt attraction in the Bay Area last year, but unfortunately it has been put on hold this year and replaced with a hay maze. I'm really hoping that this one comes back in 2014.